GoWeb3D, the leading developer of mobile augmented reality content, has released new content and announced new products on the Layar Reality Browser. Contact GoWeb3D to get your own mobile AR layer. GoWeb3D, of Boulder, Colorado and Gurgaon, India, has released new content and announced new products on the Layar Reality Browser, the mobile application that uses GPS to display real time digital information on top of reality in the camera screen of your mobile phone. 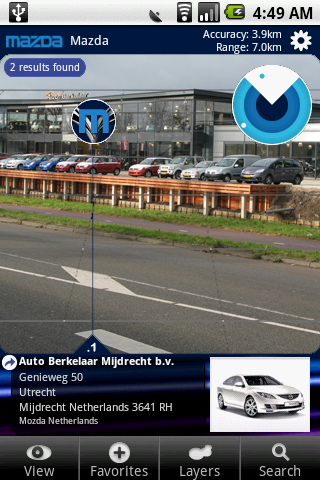 Mazda: Together with JWT International, Mazda Netherlands dealers' locations cover the mobile screen in this layer. Yelp: Yelp is designed to help people connect with great local businesses. 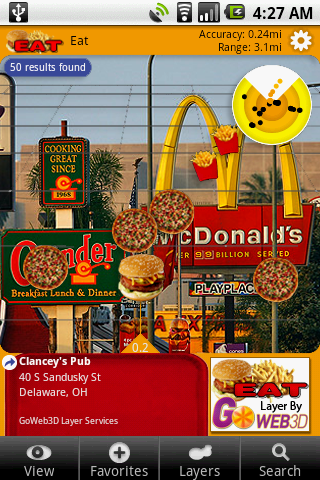 Yelp layer by GoWeb3D features the reviews and recommendations in categories such as restaurants and food, shopping, arts & entertainment, and services. 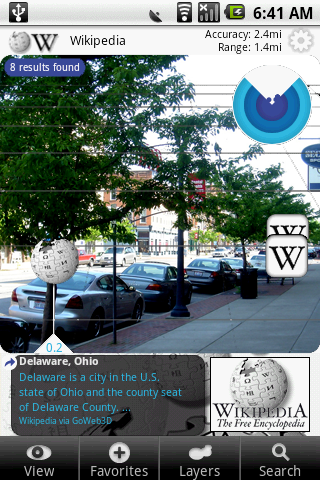 Wikipedia: The Wikipedia layer displays contextual Wikipedia information based on the mobile's location. 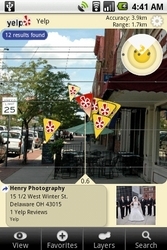 FlickAR: FlickAR by GoWeb3D displays photos from the Flickr photo management system. EAT by GoWeb3D: Need a bite to eat? Hold up the mobile and see what's around. DRINK by GoWeb3D: Bars, clubs, and nightlife are featured in this layer. Layercake by GoWeb3D: Create a personalized layer mashup. Social ARgreggator by GoWeb3D: AR versions of the world's favorite social media networks. Argo by GoWeb3D: Send Argos (AR notes) to friends around the world! GoWeb3D will collaborate with the Syracuse University School of Information Services and its students to develop a layer for the iSchool and its surroundings. GoWeb3D will launch the world's first novel via augmented reality when it brings the acclaimed Blank - The Graphic Novel http://www.blank-thegraphicnovel.com to AR in destinations across the globe. Contact GoWeb3D to learn more about Layar Reality Browser and how you can participate in the AR revolution. 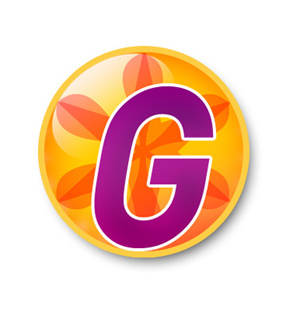 GoWeb3D, http://www.GoWeb3D.com, is an award winning creative ideas and full service virtual worlds, web3D, web 2.0, and mobile augmented reality strategy, design, products, and development firm based in Boulder, Colorado, USA and Gurgaon, India. GoWeb3D has extensive experience in Second Life, Opensim, and 3Dxplorer, among several other other social media and virtual world/web3D platforms. 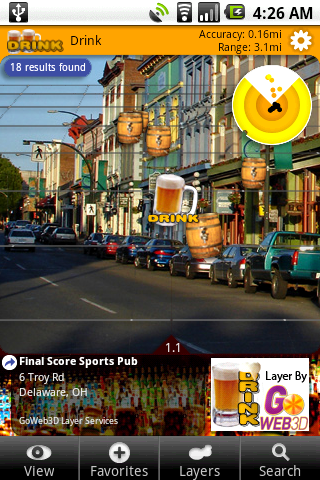 GoWeb3D is a leading developer on Layar Reality Browser. Layar Reality Browser, http://www.layar.com, displays real time digital information on top of reality in the camera screen of your the mobile phone. 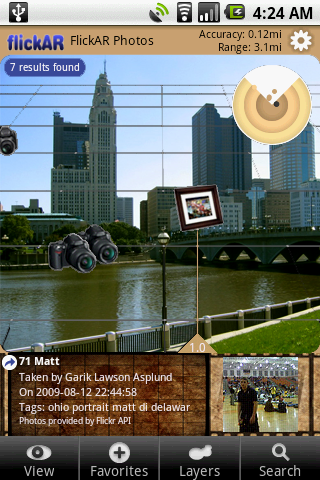 Layar was first released on June 17, 2009 in the Netherlands for Google Android phones. A version for the iPhone 3GS will be released end of summer; any other mobile phone with a GPS and compass will be considered. For more information, please contact Dave Elchoness in the US at 1-303-834-7121, dave (at) GoWeb3D.com, or Rahul Dutta in India at +91 9811778238, rahul (at) GoWeb3D.com.